Watches are one of the items that I look for when walking around a flea market, I have certain brands that I try to buy at the right price. I have found that often watches are under valued and you can make yourself a little money. 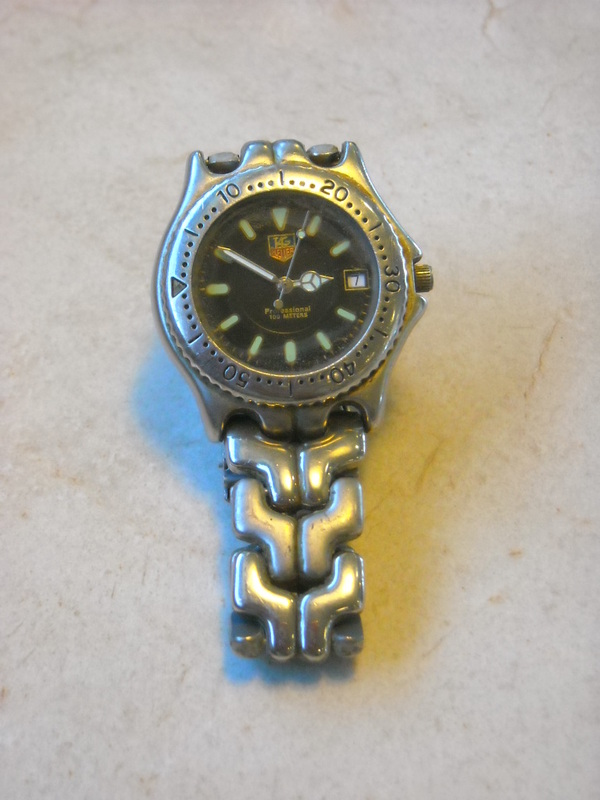 One of the items is a TAG HEUER watch, Yesterday while walking the Broadway flea market I stumbled upon a watch that looked interesting. I picked it up and asked how much. The seller said five bucks. I quickly said I'll take it. Now a genuine TAG is very expensive. Hundreds if not thousands of dollars. Being that they are so expensive, they are often faked. But five dollars is nothing. Even if it is fake I can sell it for more than five dollars. There is a list of things that you look for when you try and determine if a watch is the real McCoy. I quickly looked at the watch and it looked good. A quality watch has a certain feel. It's hard to describe but I guess they feel smooth, In addition you can look at other thing. How are the links connected. On a TAG they are screwed together. Are the links one piece or two. How is the stem made and does it have a logo. So far everything looks pretty good. The best indication is what the inside looks like. I need to open the watch. This will tell the tell. Maybe I got lucky. So if one of your pass times is walking around flea markets, start looking for watches. Make yourself a list of watches to look for. I purchased a book that cataloged old watches and refer to it often. There is one problem with watches. There are hundreds of what I call orphan brands. Watches were or are a commodity. You can have a watch maker print your name on the face of the watch and your in the watch business. So you can find lots of old watches that no one wants because someone had their name put on a watch. Another problem is that watches that were made long ago under a name brand are valuable, but the same name brand today has no value. Just a heads up. Happy hunting.